1. MrPhotoCanvas.com respects copyright laws so be sure you own the rights or have permission to use any of the images you upload for MrPhotoCanvas.com to print. We have the right to reject or refuse to print any images. 2. We will never print any of your images without your prior written consent – but we might use a photo of your end-result in our gallery - tell us "no way man!" if you like, it's your call, always. 3.The files you upload are stored on our secure servers for a year or more. If you want us to immediately permanently delete your images once printed, from our server please let us know when you place your order - it's easy to do. 4. 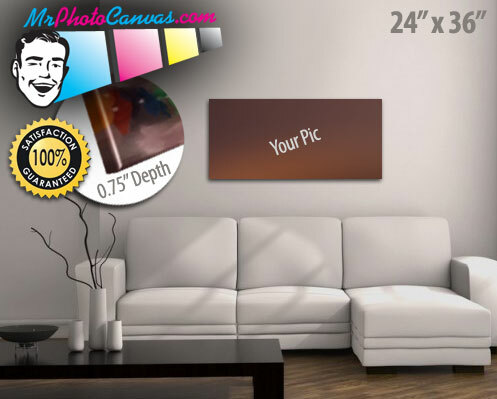 Acceptance of Terms: Upon creating a user account, you agree to provide MrPhotoCanvas.com with a current email address and to update such information immediately upon any changes. You may not use a false email address, impersonate any person or entity, or otherwise mislead as to the origin of any content. You will also need to create a password and will receive an account designation upon completing the Site's registration process. You are responsible for all activities that occur under your password or account. MrPhotoCanvas.com cannot and will not be liable for any loss or damage arising from your failure to comply with the rules stated here.